Chuck Hagel support on Sunday shows outpaced Jennifer Rubin's predictions. Chuck Hagel speaks with David Gregory during a live taping of Meet the Press at NBC July 8, 2007 in Washington, DC. The Sunday shows had given a lot of false hope to anti-Hagelians. Chuck Schumer’s December appearance on the shows was seen as insufficiently pro-Hagel; for some reason, that transmogrified into proof that Hagel’s nomination was stillborn. But Schumer eventually endorsed Hagel, and ever since has endured mockery (mostly from Rubin) for selling his soul so cheaply on a nomination that was doomed. I think Senator Hagel will be confirmed. And Republican senators have told me privately they are not going to initiate the first filibuster in history on a secretary of defense nominee. He’s taken a lot of grief from members of his own political party, many of whom he served with in the Senate. At the end, I believe he’s going to receive the necessary votes to be the next secretary of defense. On Face the Nation, Sen. Lindsey Graham repeated his constant promise to hold (not filibuster) Hagel until he gets answers about Benghazi. (Seriously, he says this all the time. It was only “news” yesterday because he’d previously demanded a hearing with Panetta, and now he’s demanding Obama.) So Sen. Jack Reed, second-ranking Democrat on Armed Services, answered Graham. This is unprecedented and unwarranted to stop or attempt to try to stop the nomination of a secretary of defense and a CIA director. We need the men and women—the men and women of the Department of Defense need a Secretary of Defense. Chuck Hagel is eminently qualified to be that Secretary of Defense. Neither of them was from “the White House,” to use Rubin’s criteria, but they were Democrats, and they were blowing off the story. On Fox News Sunday, Sen. John McCain relived his dialogue with Hagel (“YES OR NO”) before admitting that he actually won’t block a vote. WALLACE: How do you feel about other Republican senators who are suggesting some procedural move to block the nomination? MCCAIN: I think we need all the information from Senator Hagel. But the fact is we have never filibustered a cabinet appointee, and that—I do not believe we should filibuster his nomination. MCCAIN: I think we need some more information on questions that he hasn’t answered. But—and I hope those question get answered but I don’t—we’ve never filibustered a presidential cabinet appointee and I don’t think we should start here. 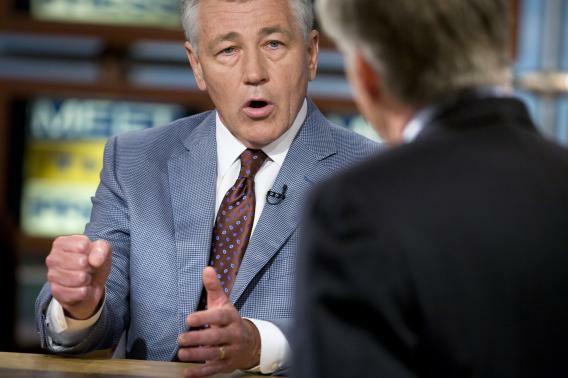 No, there was no trouble for Hagel on the Sunday shows. It wasn’t until later in the day that Sen. James Inhofe, ranking member on Armed Services, said he wanted a Hagel filibuster. But count the votes. There aren’t 41 Republicans, right now, to make that happen. Carl Levin’s talking about a Tuesday committee vote now, and Republicans are—in the voices of “anonymous Senate aides,” of course—threatening to bolt. Come on, though. We’ve witnessed a month of this. How many times can an anonymous GOP aide or two predict doom for Hagel, only to watch a Republican senator refuse to filibuster him?